Why Aren't You Going to Church? I write this as an appeal to the 65% nationally and 90%+[v] in Tucson who don’t attend church regularly. Does that list express your reasons for why you don’t attend church? If not, I would love to hear from you what your reason is. The largest group of those who don’t attend (37%) say that they practice their faith in other ways. That is wonderful! I’m so glad that you practice your faith beyond Sunday morning. Our faith is to be expressed daily and through various means (prayer, reading the Bible, service, stewardship, etc.). However, let me be very blunt: there is no space in the New Testament for authentic Christianity expressed outside of the context of the local church. From the resurrection of Jesus forward, the New Testament is the story of God’s work of salvation in and through the local church. Why is that? I can think of a number of reasons for that, but the easiest is that God designed it that way. That’s the only reason we need for church to be important, but I’ll offer a second for good measure: God’s work has always been done through a people and is leading toward the union of a diverse people. [vii] Our three-in-one God is a God in whom perfect community exists and he calls us to community, not merely to a relationship with him. The second largest group who don’t attend are the 28% who share that they aren’t believers. Each of you has a different story. Maybe you grew up in a Christian home but rejected Christianity at some point in your life, or maybe you are Jewish or Muslim or an atheist. Wherever you are on your spiritual journey, I would encourage you to attend church, and not just once or twice. I would encourage you to attend for a season of your life. Whatever your beliefs, you owe it to yourself to examine the claims of Jesus of Nazareth and re-consider at this stage of your life what he might mean for you. The third largest group says that “No reason is ‘very important.’” Oh, friend. Are you letting the niggling realities of life (sleeping in, work, football, etc.) prevent you from a weekly re-setting of the priority of your commitment to your God and Savior in your life? 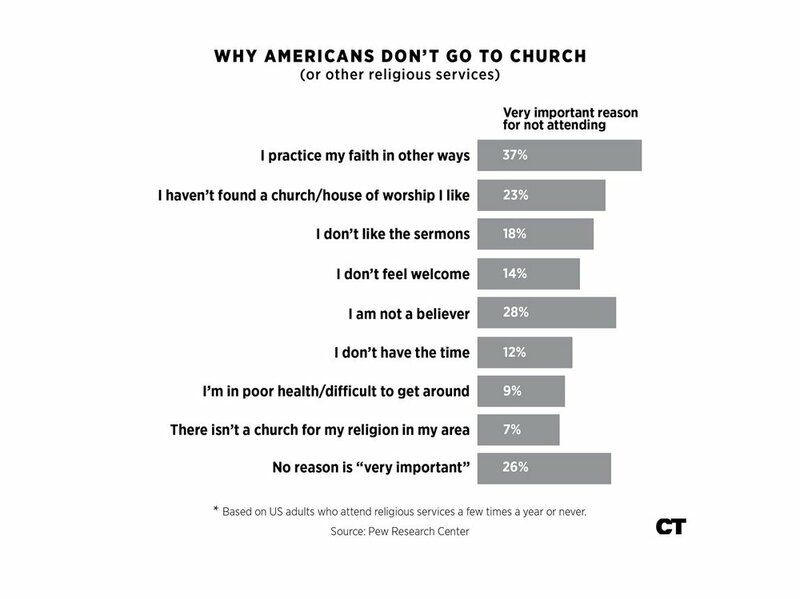 The next three reasons all point the finger at the church: “I haven’t found a church I like” (23%); “I don’t like the sermons” (18%); and “I don’t feel welcome” (14%). I don’t, for a second, doubt that you have been failed by the church. Churches are filled with humans who can fail in all sorts of ways. We can be lousy at welcoming newcomers, choosing instead to catch up with our friends; we can play good music badly or bad music badly, and I’ve preached more than a few sermons that I wish I could’ve had a chance to redo—whether because they were boring, awkward, or unclear. But give us a chance. You might’ve hit us on a bad day. Give a church at least three Sundays before writing it off. And you have the ability to read up about the church on its website and watch many services online before you go (you can do that for our services here at New Life) so that can help you find something that might be a fit for your theological bent or worship style preference. Friends, you need the church. In all its messiness and in all its faltering, you still need it. You need it because God’s Kingdom is bigger than you. You need it because God’s work on earth is through his church. You need it because just like the church, you are also messy and you also falter. And you need her to call you back to him. [iii] See https://www.barna.com/research/state-church-2016/. If you lower the threshold to attending once a month, the number rises to 50%https://www.theatlantic.com/politics/archive/2016/08/religious-participation-survey/496940/. However, both numbers are self-reported, and thus are both almost certainly lower. [iv] Our numbers were arrived at by computing Tucson’s population and dividing that by the number of churches in Tucson (of all types) and their average size. Our numbers have been confirmed externally by 4 Tucson. [v] The number of those who attend church regularly is somewhere around twice of those who are in attendance on any given weekend, so the likely number of those who attend church regularly in Tucson is about 6%. [vii] See Revelation 5, 7, 19. [x] Against Heresies, Book III.